We all know that budget isn't the sexiest word however it is the most important and first step to take when getting your finances together. So many people have no idea how much money is coming in and out of their bank account and this is why just as many people are terrible at saving. So really get to know your finances and write down how much you have coming in every month or week then figure out your expenses and what you have left over to spend and save. It will honestly change your finances so much. Knowledge is power when it comes to your money so really delve deep and stay on top of it. Read my post on how to create your budget here. Following on from creating a budget you also need to be realistic. If you are serious about saving money then you may be tempted to not allow yourself any spending money at all. You might think you have to give up your passions or things that you enjoy doing just because they cost money but this is counterproductive. You don't want to make yourself miserable because before you know it you will have a huge blowout to make yourself feel better. This also applies to your financial goal. If you are expecting to save a huge amount of money in one year on a low salary then that is obviously not going to work. Aim high but still be realistic so you can see the progress getting you closer to your final goal. So don't go crazy by being too strict on yourself or by giving yourself an impossible goal. Get things automated. If you actively have to transfer money from your main bank account to your savings account you are more likely to forget to do it or you might even just transfer it back again. So set up a direct debit or standing order for the money to come out of your account every single week before you start spending so you can always look at what you have left after your savings. When you leave your savings in your bank account you are more likely to dip into them as you go over your spending budget. But if you literally hit zero when you hit your budget you are not going to be able to spend beyond your means. Allow yourself the treats that you desire. Don't allocate all of your savings to your one big fund but pick a few smaller things that you can save for as well. I like to have a separate pot for weekends away. This allows me to have something positive to look forward to. If I know I have something exciting coming up soon I am more likely to make compromises with my purchases in the run-up. So still allow those things in your life that bring you joy. There is no point in taking the happiness out of your life to just save for one thing that may be years away. You still need to live and you never know when our end comes so stop holding back completely from doing the things you love. Now obviously you still need to compromise. You can't just dip into your main savings every time you want to book a vacation, so allocate a set amount each month to go into a completely separate pot. Out of my savings 15% goes into my "Vacation Fund" and the remaining 85% goes towards my main financial goal. This means I have two completely separate pots and will not dip into either unnecessarily. 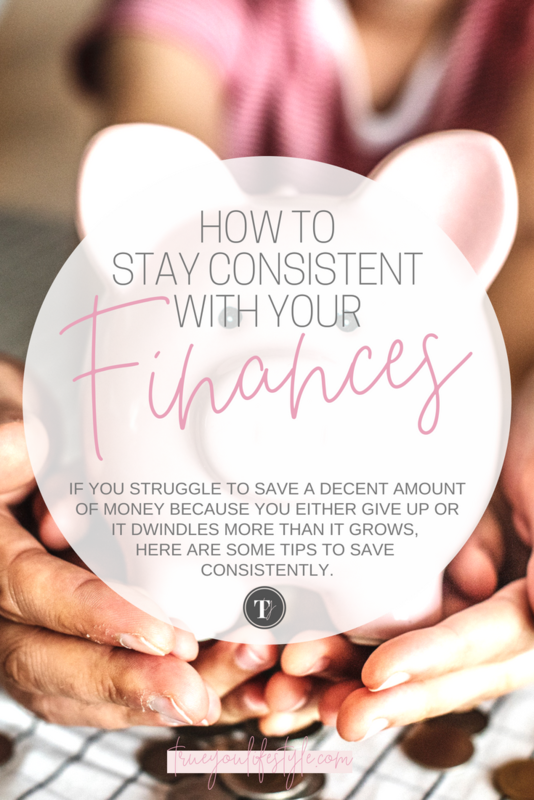 Let's face it, it is easier to be more consistent with your money if you have more of it. If you have been thinking about starting a side hustle or approaching your boss for a raise then now is the time to do it. It might sound scary but it could potentially change your life so you need to make that jump. Even if you just start making a little extra here and there, over a year or two that could make a huge impact on your savings and get you closer to your goals. So ask yourself what it is you have always wanted to do or why you deserve to be paid more and just go for it. Watch my YouTube video here on how to face your fears and do it any way. I hope you liked my ideas on how to stay consistent. Leave a comment below with what you are going to start trying to improve to get your savings on a fast track.